One of my favorite things about this book is the re-imagining of the use of magic. In this book, magic comes from within a person and helps them in one area of expertise, instead of coming from a book of spells or magical potions. I have always been a fan of magic that is born into a person instead of the kind that is learned over the years. After Piper is left without parents, she is forced to care for herself. Thankfully, Piper is an extremely talented machinist. To make her money, she scrounges around the Meteor Fields--often times with her friend, Micah--and repairs the gadgets she finds to sell. However, for many people living in Scrap Towns, finding objects to pawn at markets is their main source of income, which means the longer people wait to search for items--the slimmer the pickings become. One day, Micah decides to risk going to the Meteor Fields in the middle of a Meteor Storm. Piper, being the loyal friend that she is, runs the find him. No one in the right mind would leave the shelter during the middle of a Storm, (except, you know, Piper and Micah) so imagine Piper's surprise when she finds an unconscious girl in the fields, named Anna. Anna was found as the only survivor of her caravan heading to Scrap Town Sixteen. To make matters even more difficult--Anna has absolutely no recollection of her life before Piper finds her. But don't underestimate her--even though Anna may come across as dainty and small, she is definitely quite the fighter. Piper, however, can barely make a living for herself, let alone another human being, so she decides to get Anna aboard the 401--a train heading out of Scrap Town Sixteen. But not everything goes according to plan when the girls are caught by Gee. Gee is the security boy for the 401. He's been a part of the train's crew for as long as he can remember, and definitely does not tolerate potential trouble makers, ie--Anna and Piper. But under his tough exterior is a big marshmallowy heart of gold (because that's totally an expression). He often comes off as abrasive--because the crew that work on the train have become his only family, and he couldn't bear to let something happen to them. Because of this--he fiercely guards everyone on the 401, including--much to his disdain--Piper and Anna. I read this book for the first time about three years ago. 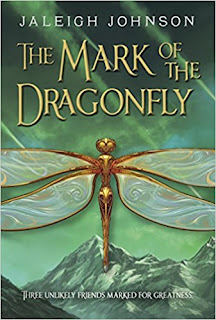 This was my first reread in nearly two years, yet even before I picked up the book, I could still remember the descriptions. I could remember how the food tasted to Piper on the 401, and I could remember Piper's pain after Anna was injured. Now, if you've read my previous book review, I know what you might be thinking. Back when I reviewed The Lord of the Flies, I complained that the descriptions were too lengthy. So if you're sitting here and thinking "SHE'S SUCH A HYPOCRITE!!!" for now saying that I like descriptions--I have an explanation. Jaleigh Johnson's descriptions aren't long or over-the-top--they're just very well-worded. Her descriptions are also paired awesomely (if I do say so myself) with lots of high-action sequences that move the plot along at a fast pace. Such an intriguing cover and your review made a convincing case to read this one. Thanks for sharing and happy MMGM! The cover is pretty awesome isn't it? I LOVE THIS BOOK SO MUCH!!! I haven’t read it in a while, though, which is sad. :( Who was your favorite character? Mine was actually Gee! Great review, Kara, as always! YAY FOR LOVING THIS BOOK!! Although I do love Gee and Anna, my favorite character is probably Piper. This book seems amazing! The characters, worldbuilding, and description all sound great—I'll have to try it! Thanks so much for the review! 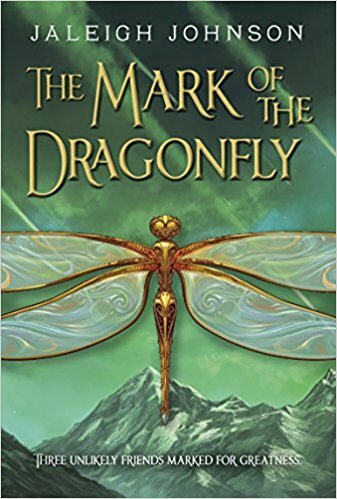 I read Mark of the Dragon several years ago, and enjoenj the the flash of memories on hearing your description! Definitely a unique world and rich story. Thanks for the recommendation, and happy MMGM! Yay! I'm so happy to hear that other people have read and enjoyed the book! Captivating cover - gorgeous! Your review intrigued me enough that I've added it to my list. Very unique story. Thank you so much! Yay! Hope you enjoy it!! This sounds really good! Nice review. I know right! So shiny and gorgeous!